Watch Dallas Cowboys quarterback Tony Romo throw an 11-yard touchdown pass to Jason Witten with only seven seconds left, to give his side a thrilling 27-26 opening day win over the New York Giants. Giants coach Tom Coughlin told reporters he blamed himself for the loss after calling for a pass play with one minute 43 seconds left, which led to the Cowboys regaining the ball. 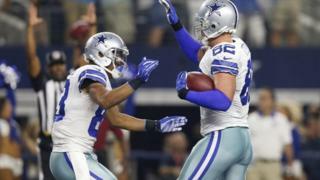 The dramatic late play gave the Cowboys their fifth straight win against their NFC East divisional rivals.